PAUL COOK highlighted Pompey’s fitness as a key factor in their last-gasp Luton success. Matt Tubbs 90th-minute goal kept up the Blues’ unbeaten start in the league. We’ve got fitness and we keep going to the end. The late, late winner moved Cook’s side up to fourth in the table. Pompey were pushing to the end as they made a trio of attacking changes to chase the game. Luton contributed to an entertaining match, but looked like they were happy to settle for a point in the finale. Cook’s side kept pushing, however, and he feels that is a testament to the work put in during pre-season. Cook said: ‘We’ve got fitness and we keep going to the end. ‘We work hard as a squad and enjoy coming into work. ‘I’m really lucky to have had total backing. ‘That’s important and I believe in working hard. ‘Now we need to keep going and work hard again. 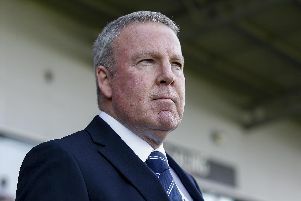 The win at Luton ends the two-game run without success for Pompey. They still went into the game with momentum, however, thanks for the comeback nature of the Morecambe draw and performance against Reading. Cook was conscious of not letting a winless run develop, though, and admitted he was keen to quickly nip it in the bud. He said: ‘It’s August and it’s a long season. ‘We’ll have highs and lows. ‘We’ll have a really good week now. We never won Saturday and Tuesday and, as a manager, I’m conscious of that. Patterns can develop.